Greenwich Council tenants will pay up to £15 more a week in rent and charges, it was announced last night. Tenants will see an average increase of £5 a week on their rent from April. The council say that this will still leave them "amongst the lowest in London." However the council are also planning to introduce new "Tenants Service Charges" of up to £10 a week. If both are introduced, tenants could see their accommodation costs rising by up to 18% on top of an average rent of £85 a week. Labour councillors said at last night's meeting that they had "no alternative" but to implement government plans to raise rents to 80 per cent of market value. They also hit out at criticism from the Conservatives, saying that people would see through their attempts to be seen as "the tenants friend." However, at the same time that Greenwich council tenants are being asked to pay more, the council has also announced that council tax will be frozen for the third year in a row. By competing with other boroughs to continually freeze their council tax, they have created a black hole which they are now seeking to fill in part by introducing new charges for council tenants. 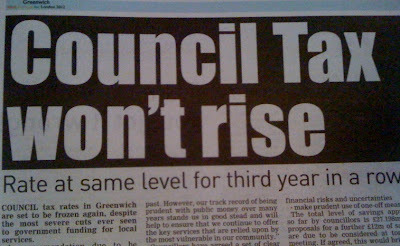 Whilst freezing the council tax gives the council good front pages for Greenwich Time, it is simply not sustainable in a time of huge government cuts. By artificially keeping council tax down, Greenwich will simply have to introduce more indirect charges elsewhere and the poorest will pay more as a proportion of their income. 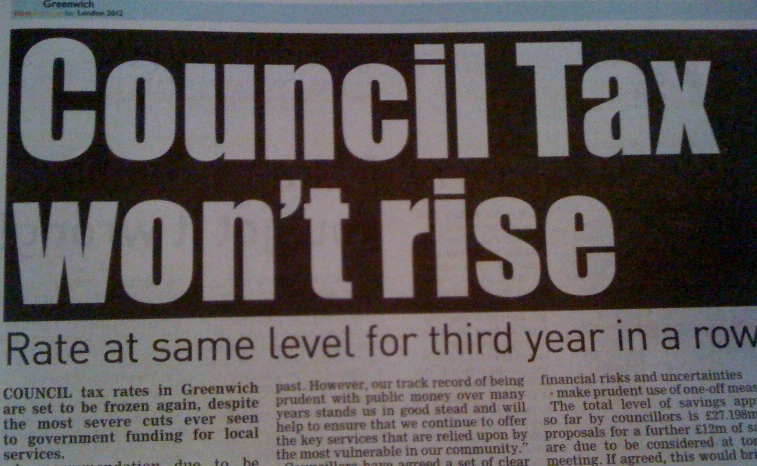 Needless to say the news of these rent increases and charges has not been included in this week's Greenwich Time.